We're all bound to make mistakes at some point in our lives. Wearing that hideous hairstyle. Staying in the wrong relationship for way too long. Or overdrawing our bank account. Finances are not immune from the human tendency towards error, so during our lifetimes, we will make mistakes. But it would be an injustice to label every financial misfortune as such. Sometimes we experience circumstances outside of our control that put us in a bad place with our money. I prefer to classify these differently, as the lessons we can learn from them are just as important, but should be analyzed using a separate system. I prefer to call these financial setbacks. Financial mistakes are when we did something against our better judgement. We took some cold, hard numbers and made an emotional decision with them that was against our best interest. Maybe it was investing in the US housing market in early 2007 with a mortgage you couldn't afford. Maybe it was trusting that your company would do what was best for your own retirement account. Maybe it was something as simple as not keeping a budget and racking up overdraft fees. When we make a mistake, it's because we could have done something better, but chose not to. The good news is that we can learn from these mistakes, and hopefully do things the right way the next time. Take note of what didn't work. Take personal responsibility for messing up. And then determine what you would do if you were caught in that situation again. 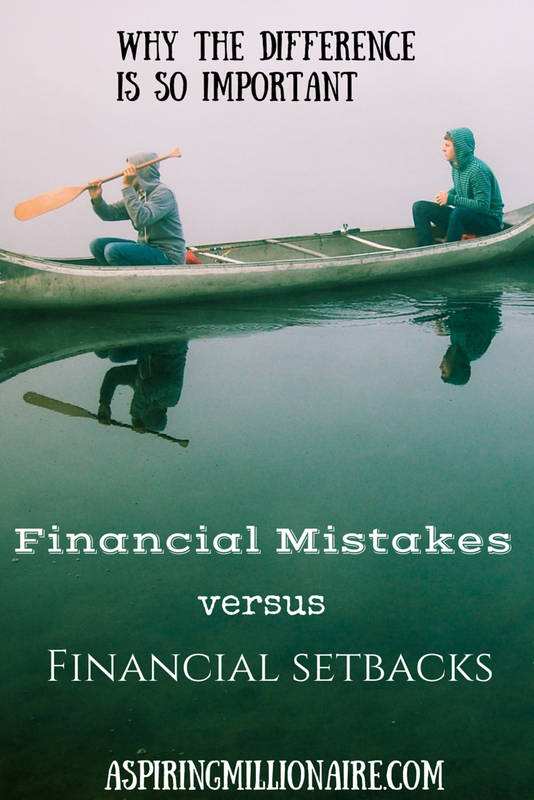 Financial setbacks happen when circumstances outside of our control mess up our financial lives. Perhaps you lost your job, got in a car accident caused by another, or the cost of living suddenly and abruptly went up in your area. These are things that you don't have control over, and that you shouldn't internalize. If you internalize them and blame yourself, you'll go around in circles asking yourself what you could do better if it happened again. The fact of the matter is the answer is probably, "Nothing." While the setbacks themselves are anything but fun, finding solutions to them can be. Setbacks can force us to get creative with how we spend or earn our money. They force us to use our imaginations to get out of a rough situation. They force us to research, learn, and grow outside of ourselves rather than reconciling our inner shopaholic demons like mistakes do. We can also collapse under their pressure. We can give up, quit, and move no where but backwards for an unforeseeable amount of time. When we get creative and move forward, we empower ourselves. We may even come up with solutions that help others when they come across a similar set of circumstances, making the world a better place. If you've made a mistake, own it. Learn from it. Do what you know you've got to do . But if you meet a setback, don't beat yourself up over it. Make a conscious decision to take control over the situation, as unpleasant as it may be, rather than letting it take control over you. You may find out you're stronger, brighter, and more creative than you ever thought you were.